The Centara Grand Island Resort Maldives is located on South Ari Atoll (Alifu Atoll) is set amongst the perfect turquoise ocean of South Ari Atoll (Alifu Atoll) in the Maldives, It provides an exclusive 5 star luxury encounter and gives the definitive in Maldives luxury. The resort offers a range of thrilling activities for both couples and families. The island is near Male’ International Airport with a transfer time of approx. 25 minutes by seaplane. Centara Grand Island Resort Maldives has 112 suites & villas. It has beach front and over water accommodation split into 7 groups. 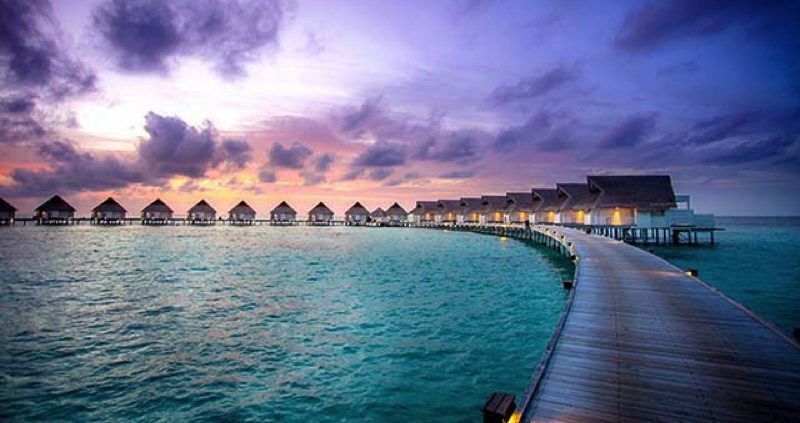 Choose from Beach suite, deluxe water villa, Deluxe family water villa, luxury sunset water villa, 1 bedroom beachfront luxury water villa and 2 bedroom beachfront luxury water villa. All of the rooms a furnished living room, bathroom with bathtub, Deluxe Beach Front Pool Villab, or personal Jacuzzi Spa and heavenly rain shower, air-conditioning, furnished terrace, flat screen TV, minibar, safe, smoke detector, IDD line telephone, Wi-Fi, hairdryer, and tea & coffee making facilities. 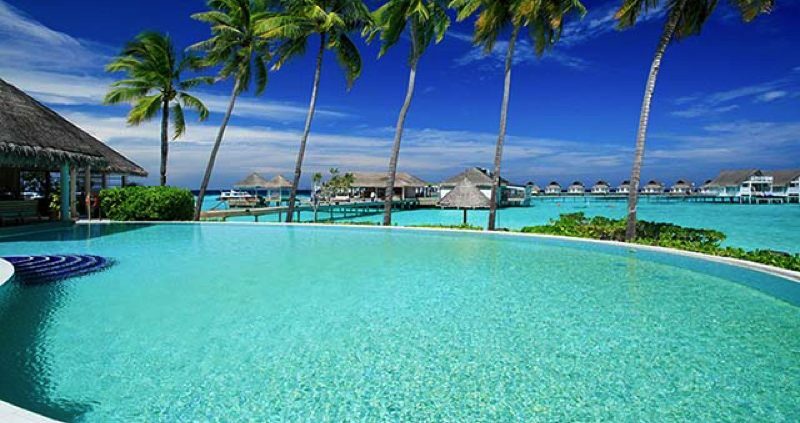 Centara Grand Island Resort Maldives features 3 pools, Beach front swimming pool, Island Club pool and children’s pool. Diving and Water Sports Centre which offers sailing, snorkelling, windsurfing, kayaking, fishing, and other water sport options. You can also hire a boat and take to the sea for the day. You will also find on the island a Sports & Fitness Centre, including tennis court, beach sport area, and other fun activities. Bars and lounges with evening entertainment. The SPA Cenvaree oceanfront village offers an exclusive and luxurious setting for traditional aromatherapy massages and together with the resort’s beauty treatment salon you will be well looked after. There is also a PADI dive centre, which caters for all levels, from beginners to experts. The island has a good house reef ideal for snorkeling, which is a must do. 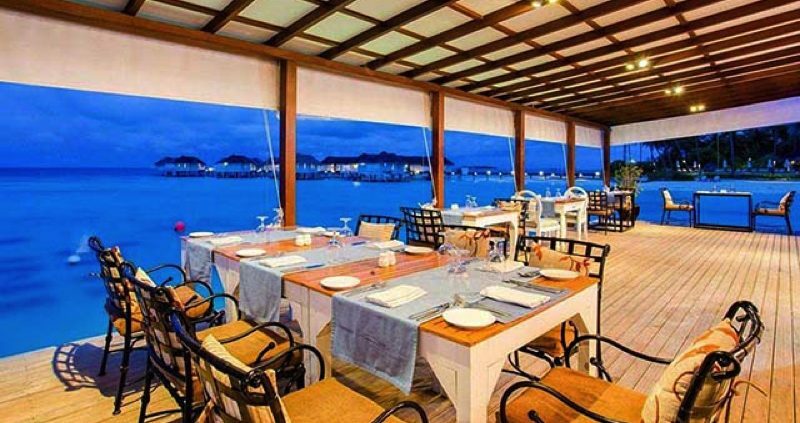 Centara Grand Island Resort Maldives has 3 main restaurants as well as offering the option of in-villa dining. Choose from Asian and western, Thai, or Seafood. Relax in the Coral cocktails, wines and bar lounge or the Aqua over water bar with snacks and drinks. For a more personalised service visit the exclusive Club Lounge. 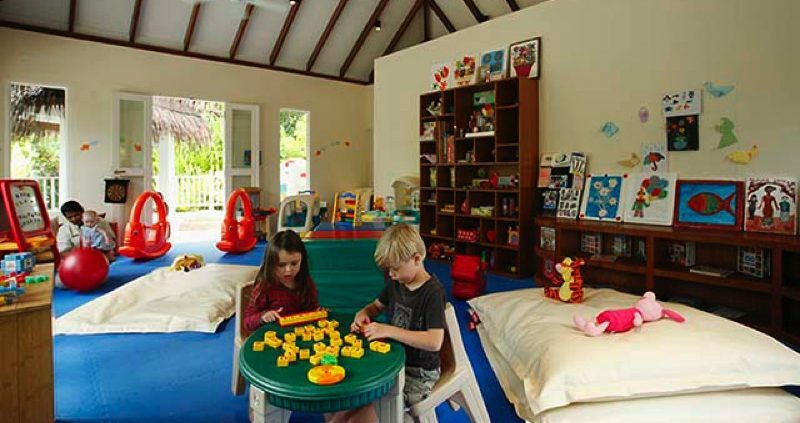 There is a Kids Club, Camp Safari, for ages 4 to 9 years and the E-Zone for ages 10–17 years. Young children are kept more than happy enjoying a range of supervised activities with qualified staff. The E-Zone offers the best and the latest in entertainment, it is designed to provide a separate area for teen’s, keeping them busy and giving them their own space. There are Video Games Stations such as PlayStation, Nintendo Wii and computer games. Babysitting service can be provided.